I was rooting around in the bottom of the freezer the other day when I happened upon a bag of frozen … well, it was definitely meat, but that’s about as much as I could tell. Could’ve been beef, could’ve been lamb. Might have been neither. I decided to play fast and loose with Saturday’s dinner, and retrieved the unidentified package for defrosting. Before anybody starts, I know it should’ve been properly labelled with a date and everything, but really, who actually does that? The next morning, I prodded the bag, poked it around a little, and gingerly opened it up. It was mutton. Big chunks of mutton shoulder on the bone. I’d bought it the month before in the hope of making a curry of some sort, but never got round to it. It’s good to have things like this in the freezer, I remember reasoning with myself as I threw the bag of uncooked meat into The Abyss, but probably better to have already cooked curries in the freezer instead. Sometimes things don’t work out how you expect them to. So, a curry. One to use up the mutton, and anything else left kicking around in the fridge, which, quite accidentally and conveniently, included a tub of Greek yoghurt and a load of tomatoes. The heart of any curry is the trio of onions, ginger and garlic. It’s so common in Asian cooking that I almost start chopping onions on auto-pilot when the idea of ‘cooking a curry’ pops into my head. This recipe calls for five onions to be sliced and fried until golden and crisp in a generous slick of ghee or groundnut oil. Set the onions aside once they’re ready, and throw a couple of whole green chillies, slit down one side, and a pair of dried red chillies into the same oil and fry them over a moderate heat until they just start to brown. The green chilli will crack and blister, the red will blacken at the edges. Add the chillies to the onions. If you want a hotter curry, add more chillies. This curry uses big, no-nonsense whole spices, so it’s very easy to cook – there’s no grinding, and little preparation, just handfuls of fresh spices thrown into hot oil and allowed to do their thing. Add two four centimetre pieces of cinnamon, half a dozen cardamom pods, five cloves, five peppercorns and a couple of blades of mace to the hot ghee or oil and stir them around. You’ll smell the spices as soon as they hit the oil. Add 500g of mutton or lamb, on the bone if possible, and stir it around a little before leaving it to sit over a medium heat for a minute or two, until the meat is browned. Flip it over, and repeat for the other side, until all of the lamb is properly browned. Reduce the heat a little, and add two large tablespoons of garlic and ginger paste, made from equal quantities of garlic and ginger blitzed up in a blender with a splash of water. Stir the meat around and cook for about five minutes, then add four or five chopped fresh tomatoes, or about 250g of canned tomatoes and cook until the tomatoes start to break down into a rough sauce. Add some salt, too. Time to add those fried onions, but with a little twist. Use a blender to blend the onions to a paste, along with 200g of Greek yoghurt, and add this to the meat and tomatoes. The yoghurt, onion and chilli mix adds both heat and calm to the meat, and it’s delicious on its own if you care to sample a little before adding it in. Simmer the dish until the meat is tender. This could be anything up to an hour or more – just keep checking. Lamb will cook more quickly than mutton. 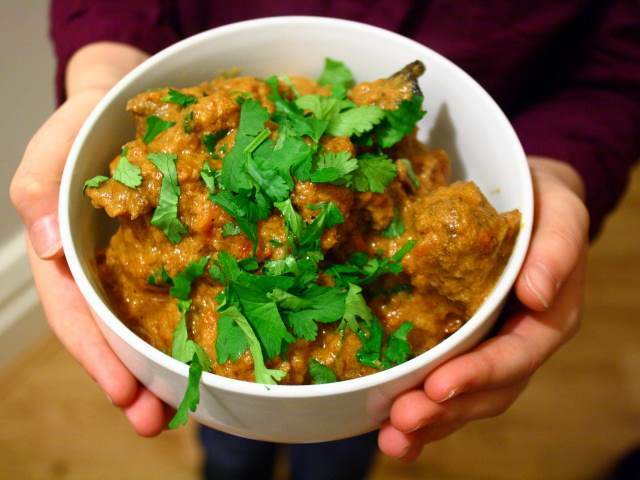 Finish the curry with a large handful of chopped coriander leaves, added at the last-minute and only briefly cooked. Server with rice or chapatis, with some hard-boiled eggs sliced on top. , by Cyrus Todiwala. It’s one of those books that have sat around for years and years on my shelves, never seeing the light of day. I think I bought it in about 2001 for about a quid in a remaindered book shop. It’s a shame I haven’t used it more – the photography and style are a little dated, but some of the recipes are superb, if you avoid the very of-it’s-time obsession with using weird meats like ostrich and crocodile. Ooooh that sounds like a beauty of a curry! yum!!!! So glad I inadvertedly had the preventive ma ki dhal and homemade naan before reading this ;)! This sounds like my favourite way to cook…impulsive yet considered. The only problem I have with this recipe – as well as my own – is the use of whole cardamom pods. I have tried cooking with just the seeds but it somehow isn’t the same, as much of the flavour comes from the pod itself. Unfortunately this means a trade-off! Unless you want to try and dredge your curry for the by now empty pods, you – or your guests – run the risk of biting down on a pod mid-chew! The taste is initially intense cardamom but very quickly has a bitter aftertaste, not to mention the nasty chewy texture! This is why Indians and Pakistanis, Afghanis and Bangladeshis precook their spices. This way you get the best of the spice and can discard any undesirable elements. A cardamom pod is about as welcome as a piece of coconut husk or the rough outer of ginger root! However, in recipes such as pilaus or dhals, where it is easy to see the pods in the finished dish, use as many as your taste allows as you can fish out the pods before serving.